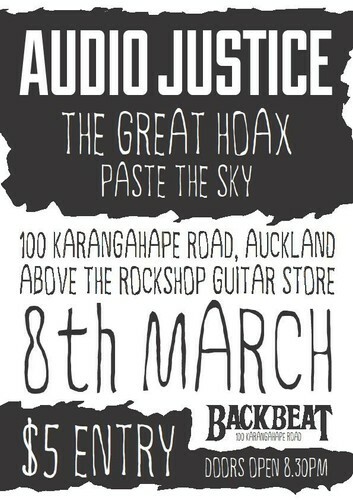 Come see 'The Audio Justice' with guests 'The Great Hoax' (a.k.a. Nick Swanson) and 'Paste the Sky' play the infamous 'Backbeat' - a night of rock n roll, atmospheric riffs, and something quite different. 'The Audio Justice' return with their 'Stone Roses' infused Brit pop rock, 'Paste the Sky' play some atmospheric indie jams, while 'The Great Hoax' plays a little bit of blues, jazz, and something quite different... and unusual as usual! Patrons who saw the last gig at 'The Kings Arms' with 'The Audio Justice' and 'The Great Hoax' will remember a great night out having a beer/wine with friends as the bands played the night away, hearing some great original music, and moshing to 'The Audio Justice'. So come along and see what the fuss is about to see some ripping good music and a good time at 'Backbeat' on K rd (on top of the Rock Shop Guitar Store).